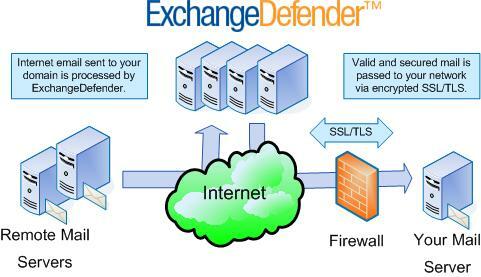 ExchangeDefender is a transparent network service designed to secure your email before it can damage your servers and workstations. It enforces your company policies, government compliance requirements and provides reporting, business continuity and even email access and collaboration when your Internet access or mail server is unavailable. Mail for your domain is pointed to ExchangeDefender via MX records (mail routing records) in your DNS (like for example: royaltechnologymanagement.com). For outbound mail security, you use our outbound smart host to route all outbound mail through our content protection network but you must have a dedicated IP address. 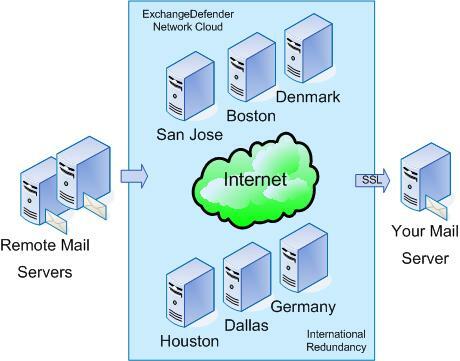 ExchangeDefender is RFC compliant and works with Microsoft Exchange, Lotus Domino, Novell Groupwise, Sendmail, Postfix, Qmail, Imail, and any other SMTP mail server. The entire deployment can be done in just a few minutes. Malware Scan - The first step in the ExchangeDefender process is a malware scan - this is where we determine if the message itself is valid and if any of the attachments are acceptable. If necessary the message is disarmed and then forwarded to the virus scanners. Virus Scan - ExchangeDefender uses up to six different virus scanning engines to determine if any of the attachments contain viruses. If we find a virus we will comply with your policy (delete, disinfect, quarantine) or we can silently dispose of the message. Spam Scan - Here we pass the message through thousands of tests to determine if it is a SPAM or a valid/clean email. Because of the number of anti-spam techniques used in this process we average 98% spam identification with less than 0.000004% false positive ratio (legitimate messages treated as junk mail). Content Scan - This is the most comprehensive portion of ExchangeDefender and the most flexible because it includes the ever evolving message intelligence part of the service. We can determine if messages contain adware or spyware, if they are "phishing" with fraudulent content, if they contain adult or foreign content not suitable for your users or if they are simply things you wish not to read. As you can tell, ExchangeDefender is very flexible to give you the level of scrutiny you need to process your email. Instead of spending your time analyzing each message you can establish rules for yourself, your department or your entire company and have them applied automatically and reliably. ExchangeDefender provides outbound content filtering as a core component of your email infrastructure. 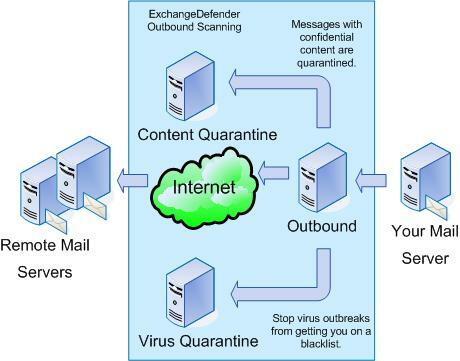 By routing all your outbound mail through ExchangeDefender outbound servers you can restrict SMTP connections to your mail servers and offload virus and content scanning onto a server connection you can control. By scanning each message for virus content we can keep you from blacklists and minimize the chance of your server being added to a blacklist. ExchangeDefender can also implement outbound policies that screen outgoing messages for confidential content and allow you to block, quarantine or forward any suspicious information leaving your organization (accounting data, confidential contracts, etc). Each outbound message also transparently creates a reverse trusted-sender entry (whitelist) for contacts you send mail to. Because you initiated the contact, the email address you sent mail to will be transparently added to your whitelist and their reply will bypass many SPAM filters. ExchangeDefender automatically applies your security policy to each message it scans, and you have a friendly web interface to properly define it. ExchangeDefender policy is very granular and easily configurable. You can establish a policy for the entire company, domain, server, and department or even allow each user to customize how their mail should be handled. 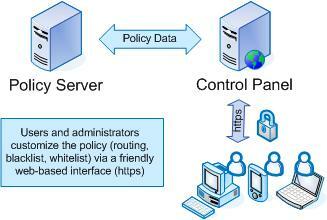 There are separate control panels for the administrators and users, all easily accessible from any device with web connectivity (https). You could spend days configuring ExchangeDefender to reflect your entire corporate policy and keep up with every new threat. However, ExchangeDefender is delivered fully configured to provide optimum security and we respond immediately to any emerging threats. ExchangeDefender delivers the mail you wish to read with minimum delay. Because the service is provided through massively scalable and redundant systems we are able to process messages much faster than you could if you loaded all the software on a single system (as is usually the case with mail servers). 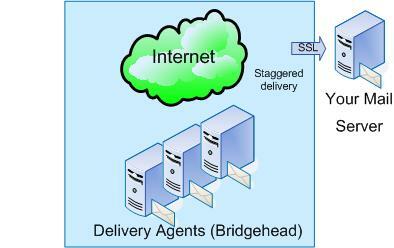 ExchangeDefender encrypts communication between mail servers and mail users whenever possible. All servers support SSL/TLS connections assuring that your mail does not get intercepted by TCP/IP sniffers. ExchangeDefender operates as a distributed cloud service, with decentralized administration, policy enforcement and archive with business continuity. What that means is that our network, spanning 2400 servers and 14 data centers with over 100 Gbit of Internet bandwidth has no single point of failure and can adapt to network outages, distributed denials of attack, mail floods and more. Based on standards, ExchangeDefender internally implements the ETRN protocol to spool mail for your server in case of network or server outage you may experience. The service is automatically enabled when ExchangeDefender cannot reach your server, for any reason. ExchangeDefender bridgeheads attempt to contact your network every minute for the first 15 minutes of outage, after which the interval is increased to 15 minutes for up to seven (7) days. ETRN can give you time to perform maintenance on your server or network without the risk of bouncing email. Once your network or server have recovered, ExchangeDefender will start to deliver messages to you in staggered mode. Each data center will only attempt several connections at a time to give your server ability to dequeue all queued mail without being immediately flooded. Furthermore, ExchangeDefender implements our own LiveArchive technology, providing you with a full, seamless and standalone email environment that your organization can continue to work from uninterrupted even if your Internet access or mail infrastructure become unavailable. We also can delivery the email in POP format, so that your favorite email client can get email right from exchangedefender at no extra cost. One of the most critical components of an external mail security solution is its reliability - you need something that will be far more reliable than your own mail infrastructure so if you ever experience an outage you have that extra layer of mail redundancy. ExchangeDefender meets and exceeds that requirement through our LiveArchive business continuity services. LiveArchive is designed from the ground up as the core component of ExchangeDefender. It is a complete standalone email system with your users, your corporate identity and your passwords, running on highly reliable geo-redundant webmail system. The beauty of ExchangeDefender LiveArchive is that it is seamless, you will not even know its there until you need it. And when you do need it you just need a web browser. Login to your account via the secure https connection, your email address and password give you access to past five days of email with the ability to respond, delete, forward and essentially continue working while your main server, workstation or Internet connection to the office are down. When your main server or workstation comes back online you can download the last five days of email. Extension to LiveArchive is also available for regulatory compliance, with flexible storage allocation at just $4/GB/month. Store the email for as long as your regulatory compliance requires it, in a secure, redundant storage network spanning multiple data centers. ExchangeDefender is an extension of your email infrastructure.How do you know what happens with email that you send and receive? How do you troubleshoot the mail flow if there is a mysterious component between you and the sender/recipient? With ExchangeDefender we offer full insight into the activity on our network, giving you control and accountability over the entire process. User SPAM Reports - Each user (and each email address) on the ExchangeDefender system can receive up to two daily reports generated at a time you specify and emailed directly to their inbox. These reports, daily and intraday, show your users which email was classified as SPAM and gives them an option to release the message into their inbox or release plus add to a whitelist so it can never be flagged as SPAM again. If access to quarantined email is critical users have full 24/7 access to the SPAM quarantines via the web, containing past seven days worth of junk mail. We also offer desktop program that tells you every hour how much spam you have. Administrator Reports - Administrative access to email is critical, especially when there are problems that need to be troubleshoot or for overall system performance. Administrators are emailed monthly reports indicating the performance of ExchangeDefender along with the full business key performance indicators. We also have the ability to provide this data at any time, on demand. SPAM Czar - SPAM Czar is a special role in the ExchangeDefender system, built specifically for the email administrators who do not want their users to be bothered with the chore of junk mail management. SPAM Czar is a special administrator that has access to the entire systems SPAM bucket, allowing them to manage releases of false positives, whitelists and blacklists. This role brings further positive productivity benefits to your organization because it puts the management of the organization on the appropriate department instead of every single user. ExchangeDefender offers multiple levels of integration and reporting with your existing infrastructure. In addition to providing flexible daily and intraday email reports, web console access, searchable logs and graphical KPI (key performance indicator) charts. You can see performance reports, to see just how much time and computer power exchange defender is saving you. ExchangeDefender is designed to be flexible and work the way you want to manage your mail infrastructure: It gives the users full control over the management of their ExchangeDefender feature set but it also empowers Administrators to easily navigate back and forth through the system and assist the users or do all the work for them. Whatever your management policy is, ExchangeDefender fits perfectly. Empower your users. Restrict their access. Move through your accounts without multiple authentications and delegate authority. Provide detailed KPI graphs and performance charts. ExchangeDefender core value is time savings. RoyAl Technology Management started the product to save time by eliminating SPAM. It has evolved into a product that saves management hours and puts the system control in the hands of those that your organization chooses. For Web Hosting Customers: $2.50 per email addresses per month for the same number of email accounts as your current package and then $3.50 per user per month for additional email addresses. This is paid on a Quarterly, Semi-Annual or Annual period. For other customers: $3.50 per email address per month. This is paid on a Quarterly, Semi-Annual or Annual period. For real time delivery and out bound delivery, you must have a dedicated IP address from your Internet Service Provider. RoyAl Technology Management offers the delivery methods of POP and direct delivery at this time.